SOS Children’s Villages association is a charity organization. Since 1997 we support SOS families for children, who have lost parental care, and help families in a crisis in the SOS Family Support centers. Our main goal is to provide safe and comfortable conditions for the development of a child while ensuring the rights and needs of all children are fulfilled. The First Lady Iveta Vējone is the patroness of the SOS Children’s Villages association since September 2015. The operation of our organization is dependant on the kindness of the donors. In order for the SOS families to be capable of raising the kids, they need the support of our donors. Municipalities the kids are born in cover half of the expenses required in order to raise them. The rest of the resources are provided to our SOS foster families thanks to the contributions of kind donors. You can participate in supporting SOS Children’s Villages! Latvia’s SOS Children’s Villages association has been granted the status of a public benefit organization. It means individuals and companies donating to Latvia's SOS Children's Villages association are entitled to an income tax deduction. Documents confirming the organization’s public benefit status can be seen here. We strongly believe that every child should grow up in a family, not an institution. In the best case scenario - in their biological families. However, if it is not possible for any reason, the child should be provided with the opportunity to grow up in a caring and sincere foster family. That is why Latvia’s SOS Children’s Villages association has been forming and supporting SOS families for kids, who have lost parental care, and helping families through difficult times for over 20 years. Latvia’s SOS Children’s Villages association is a membership-based organization. The main decision-making body is the annual general Assembly of Members. Every three years, members elect a new Association Council of 7 people. The organization has 3 honorary members. What are SOS Children’s Villages? Latvia’s SOS Children’s Villages association’s mission is to protect and care for children who have lost parental care, or who stand at risk of losing it. 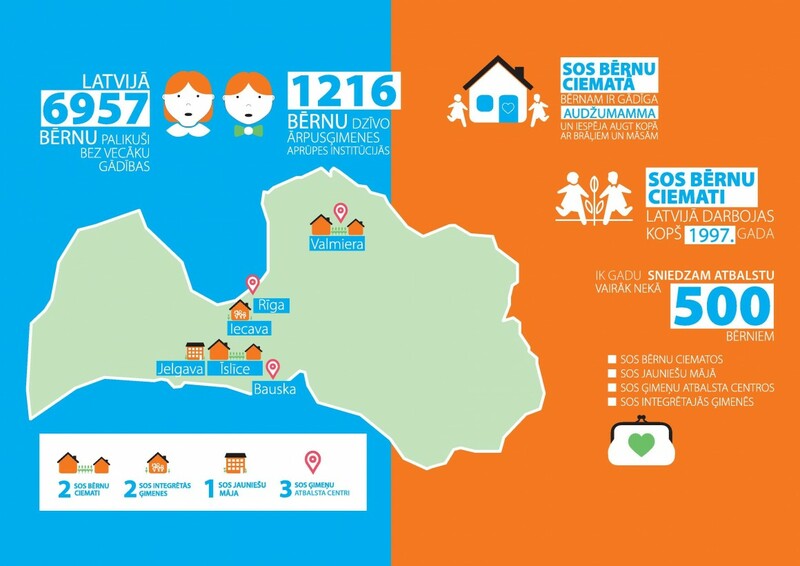 In order to care for children and families experiencing crises, Latvia’s SOS Children’s Villages have implemented numerous projects: SOS Children’s Villages and youth-homes, and SOS family strengthening projects. How do children get into SOS families? The decision to take away parents’ custody of a child is in the hands of the municipality custody court. Together with the municipal social service, they search for the most suitable substitute family for each child. If a child does not have any relatives or anyone, who is ready to take custody of the child. SOS foster families are usually chosen for biological siblings looking for a family. Brothers and sisters are not separated in SOS villages and foster families can care for up to 7 siblings. Latvia’s SOS Children’s Villages association ensures short-term care when working with families in a crisis, in an attempt to prevent family breakdown by providing psychosocial support and financial support if needed. Families can receive psychosocial support, participate in different support groups and activities for children and adults for free. Family strengthening and support centres are located in three cities around Latvia: Rīga, Valmiera, Bauska. The aim of family strengthening and support projects is to assist parents in taking care and responsibility of their children, so every child can grow up in the most suitable environment – their own family. We started these projects in 2006. Since then, more than 5000 children and their families have received help.